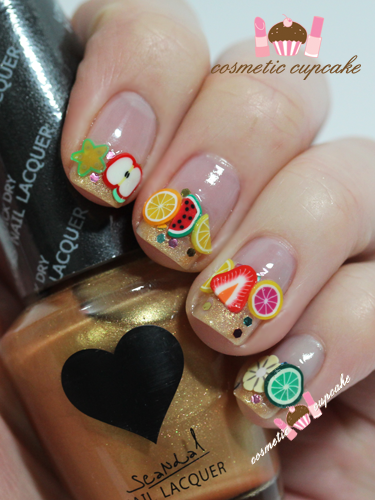 There is something about fruit manicures! I haven't done one in AGES so I thought I'd go all out this long weekend and break out the fruit fimo since I don't have to work ;) I redid one of my first fruit manicures and went with a golden fruit salad manicure! I used 1 coat of Eyeko Petite Polish as my base and sponged Scandal Cosmetics Heart Lacquer in 05 Gold Beam* onto the tips. Then I added cute pre-cut fruit fimo* just below the gold tips and some gold, blue, green and pink dazzling glitters* (aka gleequins). Topped it off with Scandal Heart Lacquer top coat* to seal it all in! Having fimo pre-cut is sooooooo much easier! I love that there's a good selection of fruits in this pack. 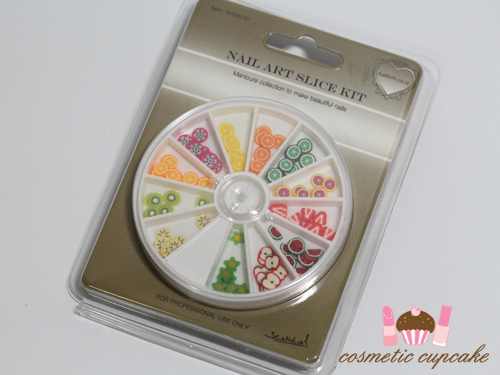 Details: Scandal Heart nail lacquers are available from Scandal Cosmetics online store for $4, nail art slices are $6 and dazzling glitters are $5. SO CUTE! Makes me wanna eat a fruit salad now :D good work Hunn! Ahhhhhh thanks hun! There's something about fruit in art form that's really cute lol. LOL OMG! THE FRUIT! I CAN'T DEAL WITH THIS CUTENESS! LOL I love you Ange xppppp I can do this for you sometime if you like!! 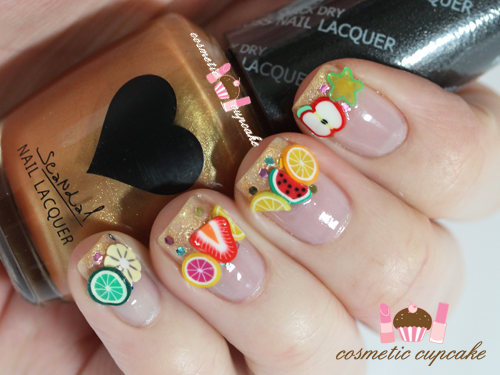 such a cute mani :D I always wori about those bits falling off. ps. you need to let me know if you still have the same adress!